The weather situation did not improve, on the third day, the snow cover was pretty impressive. 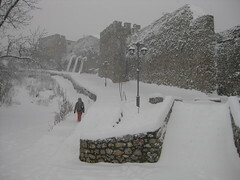 We had to go ‚deep snow sightseeing‘ :) Remember: Usually Ohrid doesn’t have snow at all. Anyway, Ohrid was a really nice place, we just regretted the weather situation. Go there during the warmer periods of the year. This entry was posted on Dienstag, Februar 16th, 2010 at 00:27 and is filed under Uncategorized. You can follow any responses to this entry through the RSS 2.0 feed. You can leave a response, or trackback from your own site.